The RCPlusNet reader provides for an easy way to record the working time and attendance of employees and guests. It contains two RFID readers (in/out) and a 5-MPix wide angle camera used to authenticate the events, two touch buttons and 2-line, 16 chars alphanumerical display. User presents the ID card/token/chip (action) to one of the built-in RFID readers initiating the camera and saving the entry to the database (event). It prevents any accidental or intentional exchange of an identity card as the taken images show the person who used the reader. Built-in RFID readers (in/out) allow registration of the beginning and the end of work/visit separately by means of cards, tokens or chips, using RFID Unique 125kHz transponders (iButton, MiFare versions are also available). Two configurable touch buttons can be used to distinguish entries and exits such as private and staff. This solution simplifies a recognition of an event type. Terminal is IP64 rated. It can be equipped with additional features, such as IR diodes, WiFi module, GSM module, GPS receiver, barcode reader. Terminal runs on Raspbian, Linux based operating system, what provides for an easy integration with any time attendance and payroll system. Reader stores clock in data in a built-in memory. Data consists of TXT files and JPG images taken by a camera. RCPlusNet Work Time &Attendance Clock communicates with a Time-Attendance-Server (TAS) using various media: LAN, WiFi, GSM (depending on equipment/option/version installed), sending the stored data to the User’s server. When LAN or GSM connection is used, the terminal obtains IP address automatically (DHCP), for WiFi it requires entering settings manually. Server can be accessed by authorized personnel, such as Accounting, Management, Supervisors and HR for analysis and further use of the clocking in data. 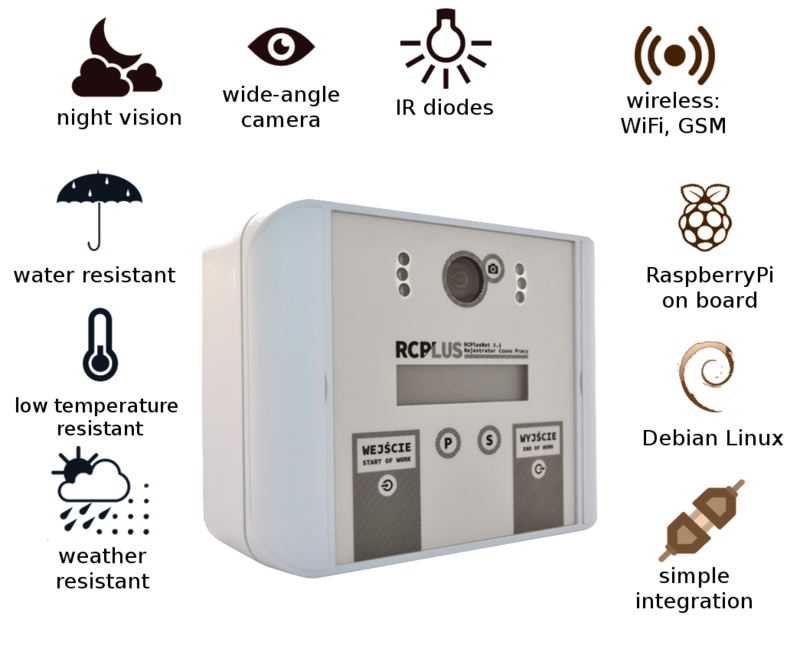 Thanks for Linux operating system, there are many possibilities to transfer the data from the RCPlusNet Work Time Clock Reader to server. Reader sends whole directory tree to the TAS using ‘rsync’ command via SSH tunnel when it is connected for the first time, and then it sends only the new data every minute (by default). If the SSH and rsync are not available, other file transfer options can be implemented, i.e. smb, ftp, nfs, sftp. As the work time clock operates on Linux based system, all the configuration details (data send interval, data format, file naming, data compression, data encryption, etc) can be easily changed and adjusted, to fit the needs of the User. Single RCPlusNet reader requires a 12V DC power supply and Cat5 cable (for LAN connectivity). Power connector accepts + and – wires in either clamp. Version with POE power supply is also available. The reader body consists of two parts – back and front, that are screwed together using 4 screws, hidden behind the latching covers. The back of the body does not have any installation holes due to the IP rating. During installation it is required to cut/drill a hole for the cabling in the back or side of the back of the body. The back is mounted to the wall using 4 proper mounting screws (depending on the surface it is instaled onto), than the cables are few into the box (the hole has to be sealed). Than the cables are connected and the front can be installed.